Chincoteague, Virginia is a unique island known as the jumping off place for a visit to Assateague Island and the Chincoteague National Wildlife Refuge. 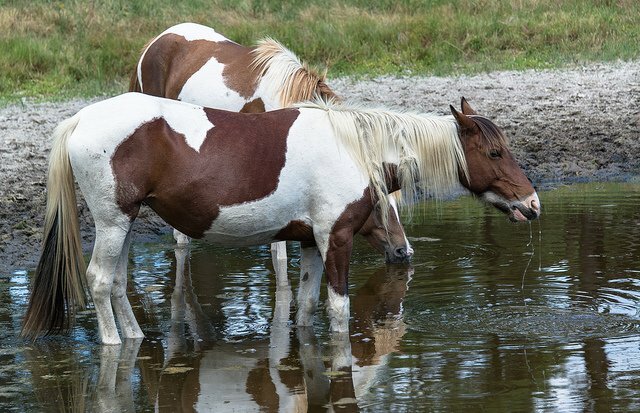 Established in 1943 as a bird refuge – primarily for snow geese – the refuge is home to plentiful wildlife and to the Chincoteague wild ponies, who live there through an agreement with the refuge and its owners, the Chincoteague Volunteer Fire Department. The ponies that live on the refuge are wild, and there are two separate herds. One group lives on the Maryland side of the island and is owned by the National Parks Service. Separated from each other by a fence that divides the island along the state line, the other herd is on the Virginia side and owned by the fire department. Each year at the beginning of July, the Volunteer Fire Department partners with the Chincoteague Chamber of Commerce for a memorable event, the Annual Fireman’s Carnival and Pony Swim and Auction. Proceeds from the month of festivities benefit the ambulance and fire services in the town. The pony swim is held on the last Wednesday of the month, the auction on the following day. The ponies are herded to Assateague Beach where they swim across Assateague Channel to Chincoteague Memorial Park. After a rest from their swim, the ponies are moved to the carnival grounds, where event tradition dictates giving away the first pony that made it to shore. The enthusiastic crowd has an opportunity to purchase a ticket to win the colt. Some other ponies are auctioned off as festivities continue. On the final day of the event, the ponies are herded back to Assateague Channel for their swim home to the refuge. There’s always been some debate about how the ponies first came to Assateague Island, some theories more plausible than others. Many believe that they are the descendants of survivors from shipwrecks on the shoals and offshore bars along the island. Others credit the infamous pirate Black Beard, believing the horses are descendants of a herd he gifted to one of his wives who lived on the island. The more likely explanation is that the ponies were brought there originally by planters sometime in the 17th century. This charming island has plenty to recommend it: beaches, marshes, forests and abundant recreational opportunities including hiking, biking, boating plus crabbing and clamming. And if you miss the thrill of the Pony Swim, the town still offers rides on real Chincoteague ponies.